We hope you had an amazing weekend. Ours wrapped up with a little bit of lesson planning for the week, which we'd love to share with you! For us, this has turned out to be one of those materials whose possibilities are endless. Take a look at some of the ways we use it, and please let us know what you do with it in the comments section below! 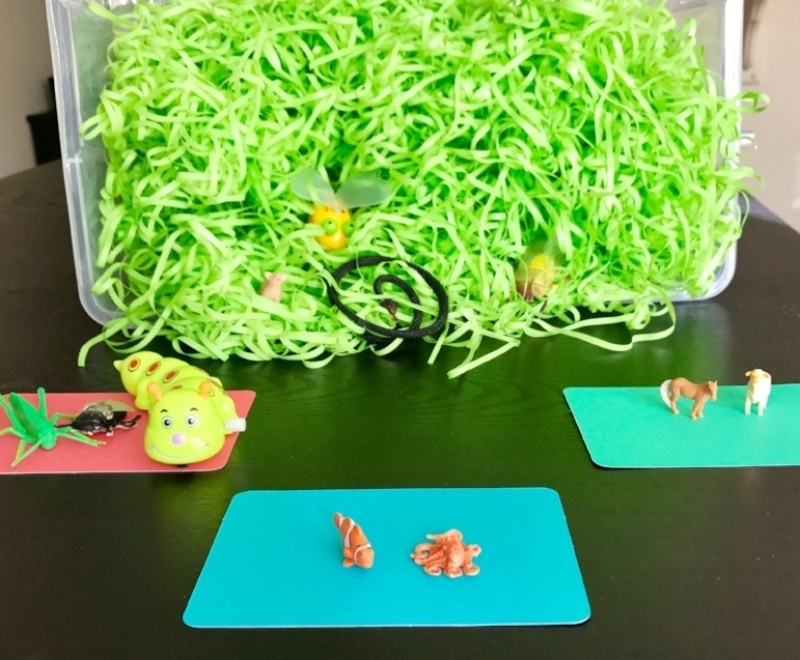 We chose a clear plastic bin, which lets the kiddos visually explore its contents before diving in, but assembling this in an opaque bin may give you a chance to build some predictions in to the beginning of the activity as well ("What do you think might be inside of this bin? Listen as I shake it. Now what do you think is in there? You take a turn shaking it. What could it be?"). Wind-up bugs are always a hit. When children are learning categories, it's helpful to offer visual clues for how and where to group items. This can be done with written category names (e.g., "Insects," "Ocean Animals," "Farm Animals"), pictures, containers, or even just pieces of paper in different colors. Not only is this fun and visually appealing, but it adds a bunch of new opportunities for grammar and vocabulary development. Practice phrases ("I found a purple/blue/green/pink egg"), verbs ("I will open the blue egg," "I opened the pink egg"), and location words ("I found a pig inside the purple egg"). The possibilities are endless! P.S. how cute is that teeny tiny pig?! What are your favorite Spring activities to do with your kids? Let us know by leaving us a comment below!